The Wigmore Hall closed its 2016/17 season with a concert of delightful improbability, seventeen solo singers and two pianists in a programme which moved from rare Schubert, through Purcell and William Croft realised/arranged by Benjamin Britten, Michael Tippett and Walter Bergmann, to Chabrier and RVW. The culmination of the programme was RVW's Serenade to Music performed by sopranos Mary Bevan, Eleanor Dennis, Milly Forrest & Gemma Summerfield, mezzo-sopranos Tara Erraught, Anna Huntley, Kathryn Rudge & Kitty Whately, tenors Benjamin Hulett, Nick Pritchard, Nicky Spence & Robin Tritschler, baritones Benjamin Appl, Marcus Farnsworth & Gavan Ring, and bass-baritone Milan Siljanov with pianists Graham Johnson and Eugene Asti. 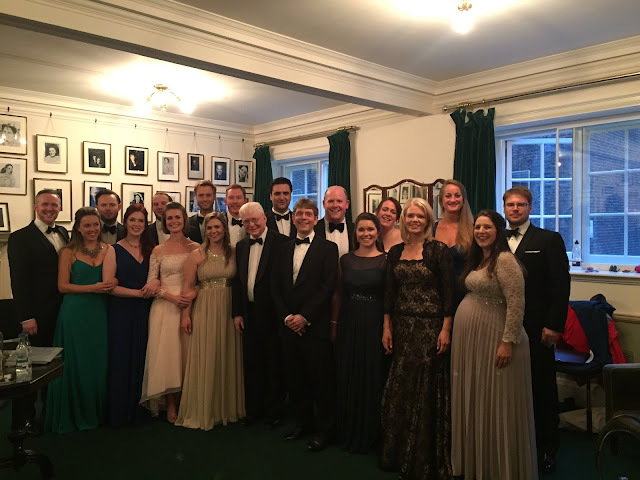 Milly Forrest replaced the ailing Ruby Hughes; as well as studying at the Royal Academy of Music and the Royal College of Music, Forrest is also a member of the Wigmore Hall's front of house staff. The first half of the programme was a sequence of rare and unusual Schubert songs and part-songs, some relatively recently discovered and others unfinished, ending with Schubert's Handelian cantata Mirjams Siegesgesang for soprano solo (Elizabeth Watts), choir and two pianos, and Schubert's Kantate für Irene Kiesewetter. Elizabeth Watts was also the soloist in Emmanuel Chabrier's Ode à la musique for soprano solo, female chorus and two pianos, in a second half devoted to songs about the muse of music. It was a carefully organised (each of the sixteen singers in the RVW had a solo song in the programme), and remarkably satisfying evening. We opened with Viel tausend Sterne prangen D642, a setting for four-part chorus and piano probably dating from 1812 when Schubert was 15. The manuscript only came to light in 1924. It was sung by nine singers, with Eugene Asti accompanying, and proved to be charming and remarkably accomplished with moments of drama. Klaglied D23, performed by Anna Huntley and Eugene Asti, also dates from the same year. A remarkably restrained yet melancholy song, with Huntley giving an affecting account of the song's telling melody. Trost in Tränen D120 was written two years later in 1814, a dialogue performed by Marcus Farnsworth and Gavan Ring accompanied by Eugene Asti, in which Goethe's words contrast the up-beat (Ring) and melancholy (Farnsworth). Finally in this group a pair of chorales, again sung by nine singers accompanied by Eugene Asti. Nun lasst uns den Leib begraben (Begräbnislied) D168, and Nun lasst uns den Leib begraben (Begräbnislied) D168 , both sober pieces, dating from 1815. The next four songs, accompanied by Graham Johnson, were all written in 1816 around the time Schubert turned 16. The Ossian setting, Das Mädchen von Inistore D281 had a fluid structure, almost operatic in form yet quite contained and was given a highly communicative performance by Nicky Spence. Am ersten Maimorgen D344 comes from an album Schubert gave Therese Grob, which was only rediscovered in the 20th century. It is a charming but straightforward piece, sung with delightful lyrical charm by Eleanor Dennis. Der Entfernten D350 , sung by Benjamin Hulett, was finely lyrical and surprisingly up-beat for such melancholy words. Klage D371 received a quiet yet very intense performance from Kitty Whately. The next group of four songs date from Schubert's 20th year. Lied in der Abwesenheit D416 is unfinished so the ending breaks off suddenly. It is a strange song, at first expressively melancholy and then suddenly perkily upbeat. It received a performance of great lyric beauty from Nick Pritchard and Eugene Asti. Lied 'Ferne von der grossen Stadt' D483, finely sung by Kathryn Rudge, was an apparently serious song but included curious quotations from Haydn's Emperor's Hymn. Nur wer die Liebe kennt D513a is also incomplete and was performed by Gemma Summerfield and Graham Johnson in a completion by Reinhard Vn Hoorickx. Lyrically beautiful, the song had some interesting twists to melody and harmony. Trost D523 , performed by Tara Erraught and Graham Johnson, was dark sombre and intense and you wondered why the song was not better known. Das grosse Halleluja D442 , a Klopstock setting from 1816, combines a homophonic chorus (sung by all sixteen singers) with a lively moving bass line on the piano (Eugene Asti), to deliberately antique effect. Following this Milan Siljanov and Graham Johnson performed Der Kreuzzug D932 which dates from 1827. A rather sober narrative, Siljanov made the song something really profound. Mirjams Siegesgesang D942, dating from the last year of Schubert's life, is one of his most intriguing pieces and makes you wonder what developments his style would have undertaken if he had lived. Following Beethoven's death Schubert was able to study Beethoven's copies of Handel scores, and Schubert was also undertaking counterpoint lessons. The result is a very Handelian cantata with a demanding, almost operatic solo soprano part, which was vividly sung by Elizabeth Watts, complemented by large-scale choruses with substantial accompaniment for two pianos and all culminating in a large-scale fugue. Yet it is not an exercise in pastiche, it is clearly Schubert relishing a new challenges and bringing real grandeur and drama into the piece. By turns grand and touching, Elizabeth Watts found myriad ways of being triumphal and the chorus and pianos joined to create a masterly performance of this little gem. I last came across it in the early 1980s when I took part in a performance of the work and it was wonderful to make its acquaintance again. The final work in the first half was another chorus piece, Kantate für Irene Kiesewetter D936 , written in 1827 to celebrate the recovery from illness of a young daughter of a major Viennese patron. Originally sung by the chorus of the Vienna opera, it is Schubert at his most Rossinian. Initially a delightful male-voice chorus and pianos, the female chorus only come in at the very end to create a delightful surprise ending. For the second half, the music was all to texts which extol the glories of music. Mary Bevan, accompanied by Eugene Asti, sang Michael Tippett and Walter Bergmann's arrangement of Purcell's Music for a while with lovely control and fine sense of line. Robert Tritschler, accompanied by Graham Johnson, sang Benjamin Britten's realisation of William Croft's A Hymn to Divine Musick, a large scale piece with a striking fluidity of construction. Robin Tritschler gave a powerfully communicative account of this large-scale piece, though I found Britten's personality came over rather too strongly in the piano part. Milly Forrest, accompanied by Eugene Asti, performed Britten's realisation of Purcell's If music be the food of love, combining plangent tone with moments of bravura. The final section opened with Benjamin Appl and Graham Johnson giving a riveting account of Schubert's An die Musik, with the music really shaped by the words. Chabrier's 1890 Ode de la Musique followed. This was a house-warming present for a friend, setting a text by Edmond Rostand and was performed at the Wigmore Hall by soloist Elizabeth Watts, female chorus and two pianos. The textures of the music for female chorus and pianos was completely ravishing, a very different and highly perfumed world. Soloist Elizabeth Watts introduced a more dramatic element, beautifully fluid in style. The whole was a complete delight and a lovely surprise. Finally we heard RVW's Serenade to Music in Guy Noble's version for two pianos. With sixteen young voices and just two pianos, the result was a beautiful chamber-sized version of a piece originally written for sixteen well established singers (many with significant Wagner experience) and orchestra. Each soloist got his or her moment in the spot-light, with some finely crafted and beautifully shaped solo interjections, all combining into a rather magical whole. The performance was crowned by a poised account of the final phrase (written for Isobel Baillie) from Milly Forrest.